Earlier this month, the County Council approved a recommendation from the Housing, Human Services and Transportation Committee, which I chair, to adopt parameters for the county’s First-Time Homebuyers Program. Findings from a recent Hawaii housing planning study identify down-payment costs as a top barrier to homeownership for working-class families and individuals. As such, the county’s housing department views increasing the availability of homeownership opportunities for Maui County residents as one of its top priorities. According to the department, approximately 23 percent of Maui County households interested in purchasing a home have the means to produce an adequate down payment. Last year, my committee considered guidelines to revive the county’s First-Time Homebuyers Program. During the fiscal year 2019 budget deliberations, the council’s budget chair initiated a $2 million appropriation to revive the program, provided the Department of Housing and Human Concerns establish reasonable program parameters. The program will offer grants to help offset high down-payment costs for eligible first-time homebuyers and will be administered through a lottery system by the county’s housing department. Interested applicants must be Maui County residents during application submittal, have a maximum household income of 140 percent of the county’s median annual income, and be able to provide other financial and qualifying documents to the department. Completion of an approved homeownership counseling or financial literacy class is also required. In addition, this week, the Housing, Human Services and Transportation Committee will consider several pieces of legislation to address public transportation and workforce housing development. The committee will consider whether to accept an intergovernmental agreement between the state and county, which proposes a 65-year, $1 per year ground lease from the state to the county. The purpose of the lease is to move the Central Maui bus hub from the Queen Ka’ahumanu Center to a portion of nearby state property in Kahului. In return, the county would issue a 65-year, $1 per year ground lease to the state for the county-owned site of the “Old Wailuku Post Office” in Wailuku. The county’s lease with Queen Ka’ahumanu Center for the current bus hub will expire in January 2020, so there is a need to move quickly to find a suitable replacement site. The state Legislature appropriated $2.5 million for construction of the new bus hub at the proposed site and the county has appropriated $650,000 for the design and planning phases. The Hawaii Housing Finance and Development Corp. also proposes to add an additional $1.5 million from its Dwelling Unit Revolving Fund for the project, if approved by its board of directors. The new site for the proposed bus hub is adjacent to a proposed affordable housing development. The close proximity of affordable housing to public transportation aligns with the state’s goal to support more transit-oriented development throughout the state. The committee will also consider a bill to establish a fast-track permitting system for 100 percent workforce housing projects. It has been well documented that the county faces a severe shortage of affordable housing units. The intent of the bill is to make the permit review process less of a burden for developers seeking to build 100 percent affordable projects. Lastly, the committee will review a bill to establish incentives and exemptions for housing projects comprising 100 percent affordable units. The bill aims to change the stigma that it is too difficult to build affordable housing in Maui County by lessening burdensome requirements and allowing the county to have more control of its own affordable housing review processes. 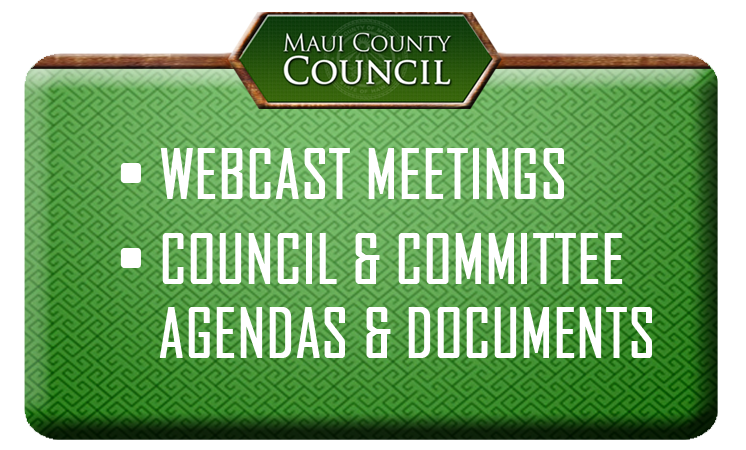 * Stacy Crivello is chair of the Maui County Council’s Housing, Human Services and Transportation Committee. She holds the council seat for the Molokai residency area. “Chair’s 3 Minutes” is a weekly column to explain the latest news on county legislative matters. Go to mauicounty.us for more information.